What’s the coolest automotive tech that never made it to production? I’m talking about tangible prototyped tech that dropped off the map. I’m choosing Ford’s experiments with organic polymers... Specifically the pe-war “Soybean Car”. What exactly was in that compound is unprovable. 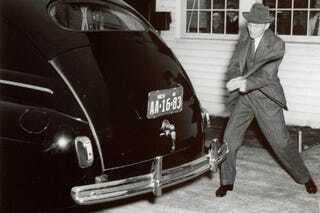 According to Ford’s project manager for the Soybean Car, it was “… soybean fiber in a phenolic resin with formaldehyde used in the impregnation.” Needless to say, Ford loved to demo his ‘plastic car’ by hitting it with an axe or a sledgehammer and showing no damage. Ford passed just a few years later, the formula vanished, the car itself was destroyed, and the tech never saw the light of day.